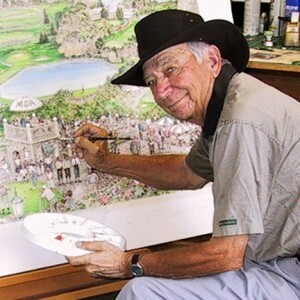 Artist/golfer Bud Chapman of Minnesota definitely seems to have made a great contribution to the game he loves, according to famed architect Pete Dye. “Bud’s innovative thinking certainly influenced many designers to make contours a little steeper and the bunkers a little deeper and generally to think outside the box with new designs,” Dye noted, making reference to the imaginary golf holes Chapman produced. Chapman, a scratch amateur golfer, took five years to paint the Infamous 18 that first appeared in Golf Digest back when I was serving as an assistant editor with the publication from 1973-1978. All one has to do to confirm Dye’s remarks is to look at Chapman’s Okefenokee Municipal Golf Course, which shows a par 3 with an island green in the middle of the swamp. Now take a look at Dye’s 17th at TPC Sawgrass with its island green to see some similarity. Chapman indicated that Dye had even asked him to join his staff at one time. Chapman pointed to the Black Diamond Golf Club in Florida as an example of where the designer created holes in an abandoned mine quarry that are better than his Mesabe Mine hole. On a more recent level, the new Donald Trump course in California spent a lot of money to create a hole with a waterfall like Chapman’s Victoria Falls as its signature hole. When Chapman’s Victoria Falls was seen for the first time in Golf Digest, the public went wild. Never in our history had we at the magazine had such a response and of course Chapman was asked to produce even more. Chapman was disappointed when Joel Goldstrand, a Minnesota golfer-turned-designer, did not get the assignment to do a Superior National in the upper part of Minnesota on Lake Superior’s north shore drive. Goldstrand had indicated a desire to have Chapman give him an assist. While admitting the new architect , Don Herfort, built a great course, Chapman didn’t feel he took full advantage of this once-on-a-lifetime location that featured wild rivers, mountains and rock formations, caverns and towering pines. Goldstrand did get a chance to build the Canyons 9 at the facility and Chapman suggests looking at his later Wolves on the Tee and Bears Playing Through paintings. So there seems little doubt that Chapman’s paintings have had and will continue to have everlasting influences on golf course designs.